This is a gorgeous corner unit with an expansive wrap-around screened-in lanai, where bar-style outdoor furniture make it easy and comfortable for you to enjoy the nightly South Florida sunsets. In the living room, the furniture is ideally positioned so that you can enjoy Punta Rassa's stunning water views from indoors as well. All of the details - crown molding, granite kitchen counter, plush carpet and coordinated décor throughout - have a designer's touch, and are inspired by the tropical setting. With a king bed in the master bedroom and two doubles in the guest bedroom, the unit sleeps six, making this an ideal getaway for friends and family. You may have found this rental on HomeAway 4363856, HA ID 4363856, VRBO 4363856ha or Vacation Rentals 4363856. 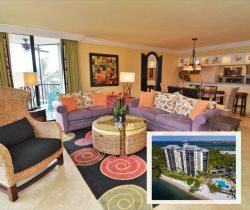 Sanibel Harbour Condominium Towers shares the property with the only AAA Four Diamond Resort in the Sanibel / Captiva area. The Sanibel Harbour Marriott Resort & Spa has been honored with the distinguished Four Diamond Award for the past 20+ years and offers to the public five dining venues including a dinner cruise and an expansive Spa. I cant wait to come back, next year! We had an excellent stay and look forward to returning. We had a very enjoyable stay-thank you! We were attending a wedding at the Marriott with our family. Our unit was closer to the wedding activities than the guest rooms at the Marriott. The fellow guests were jealous of our set up. It worked out much better than renting 2 rooms at the Marriott. Everyone we encountered was very friendly and helpful. We had an awesome week at your property. Check in/check out was very easy, the kids loved the pool and beach, and the location was convenient to everything we wanted or needed to do that was off-site. Prior to this stay, we had been staying regularly at another local property, but we will probably check yours for availability first from now on. This is hands down one of the BEST places we have ever vacationed at. The condo we stayed in was perfect! It was clean upon arrival, and had everything we needed for a comfortable stay! I would highly recommend this to all of our friends and family ! Sanibel Harbour Resort is located at the gateway to Sanibel Island and Fort Myers Beach and shares the resort with the Sanibel Harbour Marriott Resort & Spa.